A "tempera" painting on oil-primed canvas 15x10 ft by John Duncan, an early 20th century Scottish artist. The painting's size and location required a specially manufactured heavy cardboard tube 11 ft long and 3 ft in diameter, on which it was rolled for transportation to the studio. This was an exact reversal of what the artist may have had to do as the entrance doors were not wide enough for the full-size painting. 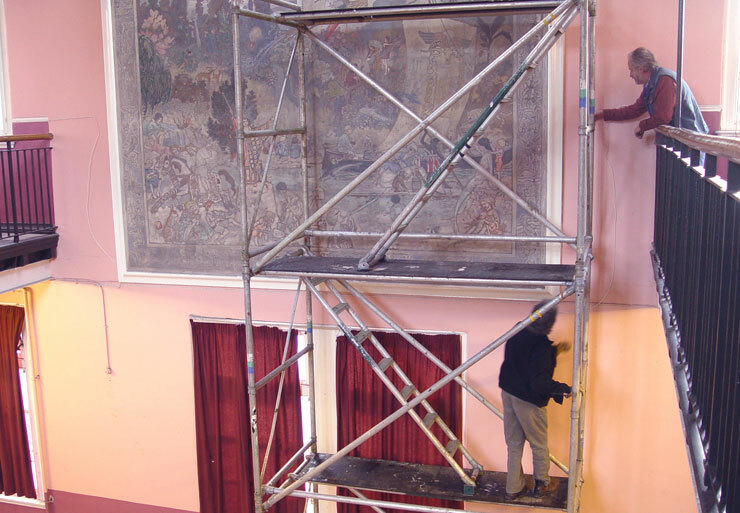 The painting had been subjected to very damp conditions and hung beneath a leak in the roof of the now disused school in Edinburgh, for which it was commissioned. It was severely discoloured, and the schoolchildren had also thrown at the painting mulberries, collected from a tree in the playground, that left many red stains on the pigment surface. John Duncan experimented with various recipes for tempera painting, a water-based technique, and in this painting it was applied onto an oil-primed canvas causing the tempera itself to flake off from the canvas support. The painting first had to be faced with protective tissue in situ before being rolled, pigment outermost, onto its tube for transfer to the studio. The pigment was treated from the front to consolidate it prior to cleaning and the canvas required strip lining around its edges as the canvas had begun to rot on the massive wood and iron stretcher. The work took 4 months. Restored for the Archdiocese of St Andrews & Edinburgh, the Gilles centre.